Posted on Friday, August 26, 2016 by "T". 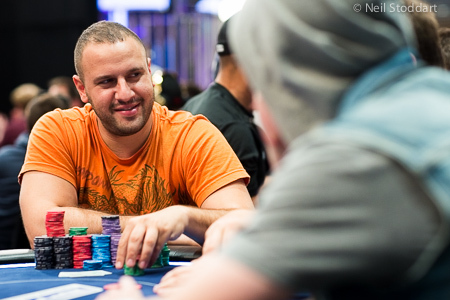 Anthony Chimkovitch, from Belgium, had an incredible run on Day 3 of the EPT Barcelona Main Event. The 23-year-old showed the experience of a long-time pro and managed to turn 144k in chips into a massive stack of 1.8 million! 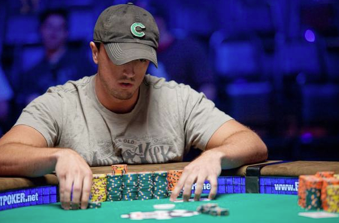 Chimkovitch was the first player to cross the 1 million chip mark, eliminating players such as US pro Chance Kornuth (close to $4.5 million in tourney earnings) along the way. EPT Barcelona Main Event Draws Record Field! Posted on Thursday, August 25, 2016 by "T". The EPT Barcelona Main Event is the biggest Main Event in EPT history with 1,785 entries! Thanks to so many entries, a massive €8,657.250 prize pool is up for grabs! Now, the money bubble has already popped (top 359 spots get a share from the prize pool) after 2 days of play and 290 players will return to the tables today and continue fighting for the top prize of €1,122,800! 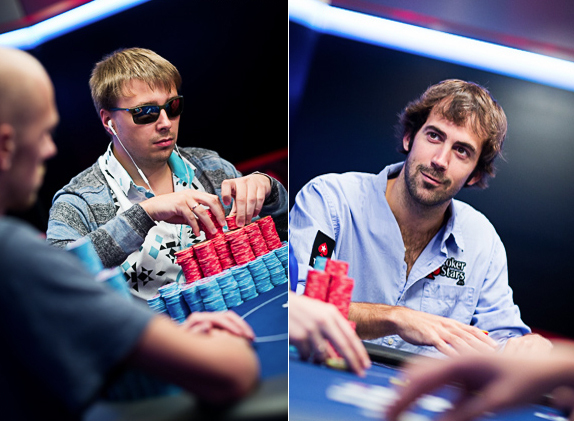 Read more » EPT Barcelona Main Event Draws Record Field! EPT Barcelona: Pratyush Buddiga Wins €25k High Roller! Posted on Wednesday, August 24, 2016 by "T". It took a bit less than 15 hours of play until just one player remained in this year's €25k Single Day High Roller in Barcelona, Spain. US poker pro Pratyush Buddiga bested an extremely tough field of 162 players to claim the title and $690,275 in prize money! 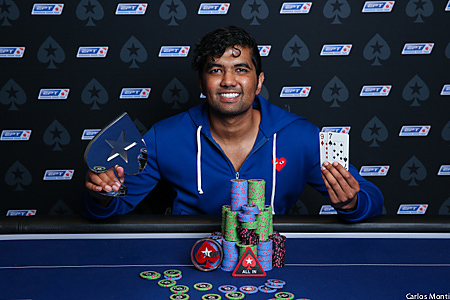 Read more » EPT Barcelona: Pratyush Buddiga Wins €25k High Roller! Posted on Tuesday, August 23, 2016 by "T". Germany's Fedor Holz brought the second largest stack to the 2016 EPT Barcelona Super High Roller final table on Monday, and he declined all proposed deals when there were 3 players remaining out of 9 (he must have had a good feeling he was going to be the winner). Posted on Thursday, September 03, 2015 by "T". Last week we reported about EPT Barcelona's biggest and most important events. Aside from all record-breaking tournaments, there were several interesting high stakes cash games running at Casino Barcelona during the poker festival. This might be the most intersting pot, though. On Wednesday, 27th September, Dani "Ansky" Stern wrote on 2+2 about how he was cheated out of €18k in a €100/€200 Pot Limit Omaha cash game. Posted on Tuesday, August 25, 2015 by "T". Just as in the Super High Roller at the EPT Grand Final in May, Dzmitry Urbanovich once again fell one position short of winning a Super High Roller title in the EPT Barcelona Super High Roller, which concluded yesterday evening. Posted on Monday, August 24, 2015 by "T". The final day of the EPT Barcelona Super High Roller (€50,000 buy-in) starts today at 12:30 p.m. local time. 9 players have made it this far by outlasting 76 other players (total entries 85 players + 14 rebuys) over three days of play. Posted on Thursday, August 28, 2014 by "T". The third and final day of the EPT Barcelona High Roller started with 21 players from a record field of 295 (+98 re-entries). It took some time before the final table of eight players was set due to some small stacks that managed to hang on for a bigger payday. 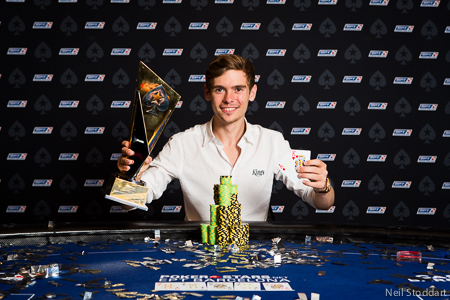 A big congratulations to Andre Lettau, the winner of the richest Main Event (100th) in European Poker Tour history! 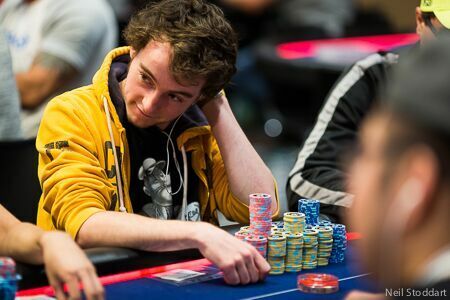 Lettau, a 27-year-old online pro from Germany, entered the final table in the middle of the chip counts. After several hours of play, he the other two remaining players struck a deal (Hossein Ensan €652,667, Lettau €704,058 and Sam Phillips €1,021,275) that left €90,000 and the title to play for. Posted on Wednesday, August 27, 2014 by "T". The recording-breaking field of 1,496 players has been narrowed down to a final table of eight after five intensive days of play. Out front is a German named Hossein Ensan who won Event #3 of this festival 10 days ago for €4,535, the biggest live cash of his career. 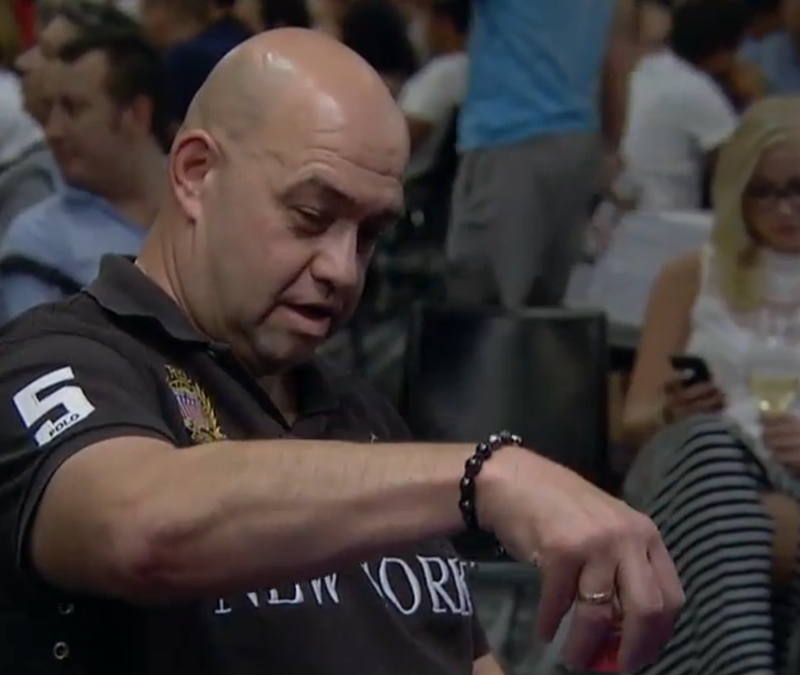 LIVE STREAM: EPT Barcelona Main Event: His $80 "Investment" Can Make Him A Millionaire! Posted on Tuesday, August 26, 2014 by "T". On Monday, 102 players returned for Day 4 of the biggest EPT Main event in history. After six levels of play and 12 long hours, 25 players bagged up chips and the chip leaer was Bram Haenraets of Netherlands with 4,395,000 in chips! Read more » LIVE STREAM: EPT Barcelona Main Event: His $80 "Investment" Can Make Him A Millionaire! Posted on Friday, August 22, 2014 by "T". On Thursday, a massive field of 475 players went to Casino Barcelona to participate in Day 1A of the 2014 European Poker Tour Main Event! 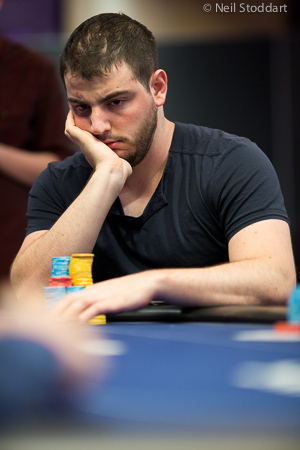 After eight 75-minute levels of play, the tournament director called it a day and Michael "The Grinder" Mizrachi bagged up the largest stack (186,600) amongst the 279 survivors. Posted on Thursday, August 21, 2014 by "T". 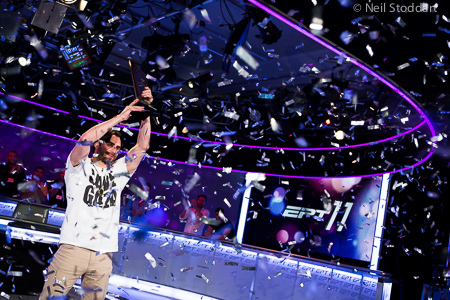 A big congratulations to Olivier Busquet, the winner of the 2014 European Poker Tour Super High Roller - the biggest Super High Roller in EPT history! 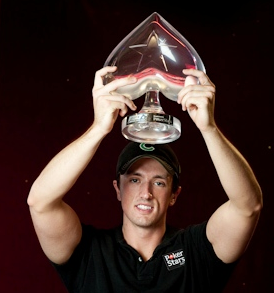 It was the 32-year-old poker pro's first major tournament victory outside of his native United States. Posted on Wednesday, August 20, 2014 by "T". The 2014 EPT Barcelona Super High Roller (buy-in €50,000) attracted a total field of 77 entries - which makes it the biggest Super High Roller in EPT history! Now, after 2 days of play, there are only nine players left with the chance of taking down the tournament and its €1,016,700 first-place prize! Posted on Thursday, August 14, 2014 by "T". PokerStars' European Poker Tour celebrates its 100th event right where it all started, Barcelona, Spain! EPT Barcelona will for the third time team up with the record-setting the Estrellas Poker Tour (ESPT), which drew 1,798 players to its €1,100 Main Event last year! Posted on Monday, September 09, 2013 by "T". A big congratulations to Thomas "hitthehole" Middleton, the winner of the Season 10 European Poker Tour Barcelona Main Event! The tournament attracted a record field of 1,234 players, and on Saturday the final eight players returned to battle it out on the final table. After about five 90-minute levels of play Middleton of UK, who had been the chip leader since Day 3, had all the chips in play and received €942,000, the trophy, and a Slyde watch for the victory. Posted on Friday, September 06, 2013 by "T". Although various players had the chip lead during Day 4, Tom Middleton once again bagged up the lead at the end of play. The Englishman started Day 3 with 1,030,000 chips (the only player with 1m+ chips) and will bring nothing less than 3,986,000 chips to Day 4, which will see 24 players returning to the tables. Gerard Piqué, a Spanish footballer who plays as central defender for FC Barcelona, is doing very well in the €10,000 High Roller! In fact, he built a sweet 308,500 stack during Day 1 and is currently ranked 5th of the remaining 98 players (168 entries in total). Leading the way into Day 2 is Ole Schemion who bagged up 393,600 thanks to some big pots during the last stages of the day. Besides Schemion and Piqué, big names such as Eugene Katchalov, David Benefield, Chino Rheem and Ludovic Lacay will all bring healthy stacks to Day 2, which begins on Friday at 12 p.m. with registration open until 11:45 a.m. Friday morning. In other words, we might see some late entrants and some players using their second bullet. Posted on Thursday, September 05, 2013 by "T". Day 3 was an action-filled day of poker as the field of 235 players was narrowed down to 79 players in just five 90-minute levels of play. At the beginning of Day 3, Pablo Tavitian held the lead and was looking to be the first player ever to win both an LAPT and an EPT, however, the Argentinian pro's dream won't come true this time as he was sent packing already in 127 place for €10,000. Posted on Wednesday, September 04, 2013 by "T". Day 2 of the EPT Barcelona Main Event is in the books and there are now only 235 of 1,234 players left! 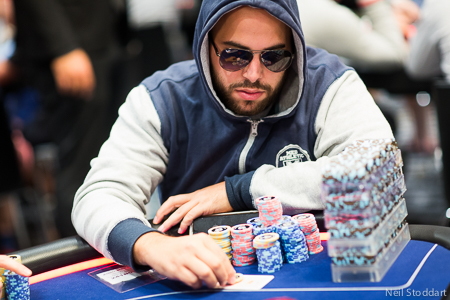 The new chip leader is Pablo Tavitian who bagged up 465,000 chips at the end of Day 2. The Argentinian pro won a Latin America Poker Tour event earlier this year in Vina del Mar, Chile for $184,220, and now has the chance to give his bankroll an incredible boost as a prize pool of €5,984,900 is up for grabs (the winner will get €1,067,000). EPT Barcelona: 708 Players Entered Day 1B! New EPT Record About To Be Set! Posted on Tuesday, September 03, 2013 by "T". 708 players signed up for the second flight of the EPT Barcelona Main Event, which brought the total number of entrants to 1,226 - a new record for EPT Barcelona! However, the number of entrants is still not final as the registration is open until the beginning of Day 2 (a new rule change for EPT season 10 that applies to all High Roller events, Super High Rollers and Main Events) and the all-time record EPT field outside of the PCA is in serious jeopardy. The current record hasn't been broken since Season 6, when the San Remo Main Event attracted 1,240 players! Read more » EPT Barcelona: 708 Players Entered Day 1B! New EPT Record About To Be Set! Posted on Monday, September 02, 2013 by "T". On Sunday, the first day of the 2013 EPT Barcelona Main Event kicked at the Casino Barcelona. 518 entered the tournament for €5,300 each and battled for eight 75-minute levels. A total of 308 players made it through the day and Dragan Kostic was the only player to surpass 200k in chips. 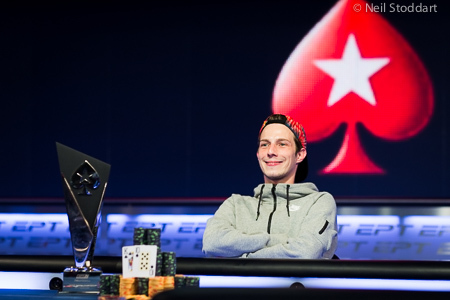 The Spaniard, who finished second to Martin Schelich in Season 8's EPT Barcelona Main Event, will be joined to Day 2 by Team PokerStars Pros Marcel Luske, Vanessa Selbst, Jonathan Duhamel, Jason Mercier, Eugene Katchalov, and others. According to PokerStars Blog, several big names have already signed up for Day 1B, including Team PokerStars Pros Daniel Negreanu, Nacho Barbero, Martin Hruby, Max Lykov, Ivan Demidov, Christophe and Matthias De Meulder, Luca Pagano, Toni Judet, Johnny Lodden, Leo Fernandez and Team PokerStars SportStar Fatima Moreira De Melo and Friend of PokerStars Pierre Neuville. We will be back with another update tomorrow! 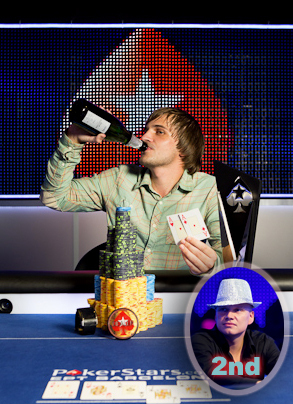 EPT Barcelona: Vitaly Lunkin Wins The Super High Roller! The European Poker Tour Barcelona €50,000 Super High Roller (the first event of EPT Season 10) came to an end on Sunday with Vitaly Lunkin as the champion! The event saw 51 entries and Lunkin, a Russian poker pro with two WSOP bracelet to his name, had to overcome increadible players such as Erik Seidel, Steve O'Dwyer and David Benefield at the final table! He received his first EPT trophy and a sweet €771,300 for the amazing achievement and now "only" needs a WPT title to complete poker's Triple Crown! Posted on Monday, August 27, 2012 by "T". It ended up being a very interesting final table of the EPT Barcelona Main Event this weekend as famous players such as Ilari Sahamies and John Juanda were on it. Unfortunately Juanda was the first player to hit the rail and he received €76,100 for his 8th place. Posted on Friday, August 24, 2012 by "T". Day 4 of the EPT Barcelona main event just came to an end with 24 survivors. Samuel Rodiguez, who started the day with the 2nd largest stack, is now in a big lead with 5,330,000. Antonin Duda, who lead the way into Day 4 with 1.47 million chips, is also alive, but he has dropped to 4th possition with 2,054,000 chips. Notables such as John Juanda, Ilari Sahamies and PokerStars Team SportStar Fatima Moreira de Melo will also return to play today with hopes of making it to the final table, where some serious cash is up for grabs. The next 8 players to hit the rail will receive €29,400 each, which is nothing compared to the money that is up for grabs on the final table. For example: the winner of the tournament will get €1,007,550, the runner-up gets €629,700 and a 3rd place finish pays €404,050. EPT Barcelona Main Event: 61 Players Left. Ilari Sahamies in 3rd Place! Posted on Thursday, August 23, 2012 by "T". After 3 days of play, PokerStars' European Poker Tour Barcelona main event player field has been narrowed down from 1082 players to only 61. Day 4 will begin in a few hours with Antonio Duda as the chip leader (1.47 million), closely followed by Samuel Rodriquez (1,141,600). In third place is no one else other than the Finnish high-stakes guru Ilari Sahamies with 1,269,000 chips, followed by John Juanda (968k) and Fatima Moreira de Melo (955k) in 4th and 5th place, so expect Day 4 to be something special! All of the remaining players are guaranteed to walk away with €11,550 each. The 9 players who make it to the final table will be guaranteed at least €55,100 each. However, no one will probably be happy with that amount since the first prize is an astounding €1,007,550! Posted on Friday, August 17, 2012 by "T". The long-anticpated Super High Roller in Barcelona, Spain, is now just 1 hour away and lots of well-known faces in the poker world are getting ready to compete for some serious cash, including Phil Ivey, Jonathan Duhamel, ElkY, Daniel Negreanu, Jason Mercier, John Juanda and Erik Seidel. According to the latest updates, Nearly 50 players are confirmed to be registered for this brand new event, which is set to become the largest poker tournament ever held on Spanish ground. The event will be played over the next 3 days and players will begin with 250,000 chips each. The blinds will start at 500/1000 (100 ante) and all levels will last an hour. Posted on Friday, September 02, 2011 by "T". 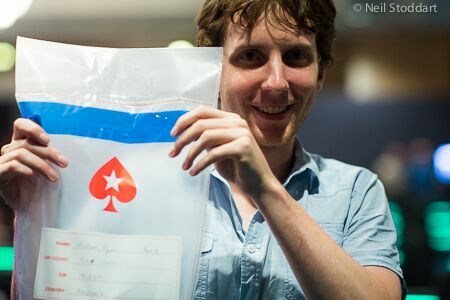 A big congratulations to the winner of the EPT Barcelona main event, Martin Schleich. Schleich, from Germany, came to the final table 5th in chips, and he battled his way all the way through. When play was down heads up, Schleich had a 2-1 chip lead and it didn't take long before he had defeated his final opponent, Dragan Kostic. For the win Schleich took home the first prize of €850,000 and also the biggest live poker tournament Spain has ever seen. Below are the final table results. 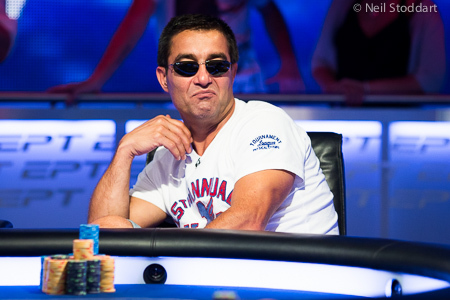 EPT Barcelona: 8 players left - Eugene Katchalov is one of them! Posted on Thursday, September 01, 2011 by "T". 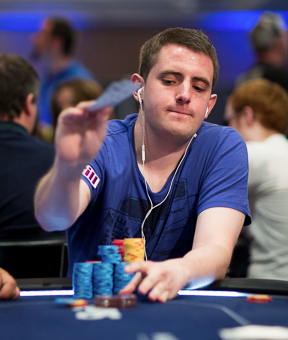 The EPT Barcelona main event has now been narrowed down to a final table with 8 players. 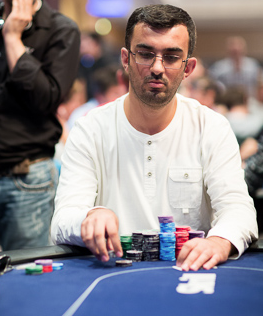 Tomeu Gomila, from Spain, is still in the chip leader, however, his lead is even greater now than when Day 4 started. In total, he will 6,985,000 chips to the final table today - the 2 closest competitors have about 4.5 million each. So, Gomila is definitely the big favorite to take home the €850,000 first prize and the biggest poker tournament ever held in Spain. 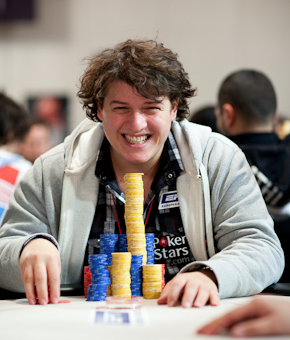 The only big name who made it to the final table is the Team PokerStars Pro Eugene Katchalov. But things are not looking very good for him at the moment since he only has 690k left and the blinds will be 25,000 - 50,000 with a 5k ante. Well, anything is possible in the game of poker so we will just have to wait and see what happens. Posted on Wednesday, August 31, 2011 by "T". The third day of the EPT Barcelona main event is over and there are now only 24 players left. The first two days of the tournament were dominated by 2 French poker players, Guillaume Darcourt and Xavier Caruggi, but Day 3 was all about 2 Spanish poker players, Tomeu Gomilla and Raul Mestre, and they will return to the tables today with the biggest stacks. Apart from Team PokerStars Pros Eugene Katchalov and Matthias De Meulder there aren't many known players left in the tournament, but this doesn't necessary mean that the rest of the tournament will be boring to follow. A first place prize of €850,000 is up for grabs and it comes along with a trophy (picture) and the honor to have won Spain's biggest poker tournament ever. EPT Barcelona: A new Frenchman in the lead! Posted on Tuesday, August 30, 2011 by "T". Another day of the EPT Barcelona main event is now in the books, and the player field has been narrowed even further. 141 players will return to the tables in a few hours time and continue the trip towards the €850,00 first place prize. 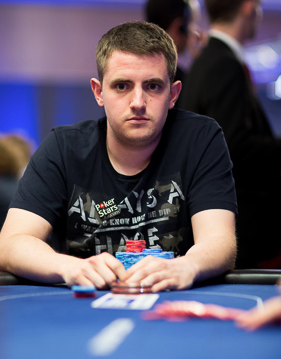 The chip leader still comes from France, however, it's no longer Guillaume Darcourt but Xavier Caruggi with 577,700. Darcourt, the Day 2 chip leader, has dropped to 7th place and will bring 380,100 chips today. The two biggest names that will join Darcourt and Caruggi in the top of the field today are Vanessa Selbst (USA) - 364,500 chips, Victor Ramadin (USA) - 252,900 chips. We will return with an update as soon as Day 3 comes to an end. Posted on Monday, August 29, 2011 by "T". 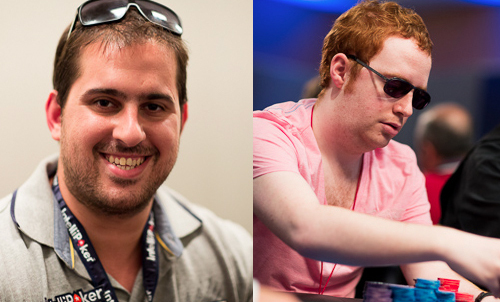 The EPT Bacelona main event began on Saturday and already the 2 starting days are in the books. In total, the main event attracted a field of 811 players and 407 of them have chips left and will return to the tables today. Guillaume Darcourt, from France, finished 35th in the World Series of Poker main event this summer and now he's the EPT Barcelona chip leader with 195,300. As you can see in the picture, it's not hard to spot out the chip leader among the other players. Posted on Monday, December 13, 2010 by "T". Today it's time for the last stop on the EPT Tour for this year, EPT Prague. The first starting day of the EPT Prague Main Event is about to begin any minute now. The buy-in for the main event is €5000+€300 and EPT Barcelona winner Kent Lundmark is one of the most interesting pros that will take part. There will also be a high roller event with a buy-in of €1000+€300 that will be played over 2 days. 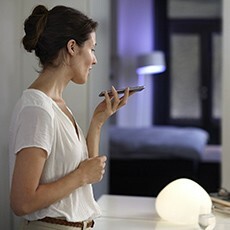 We will follow these 2 events and keep you updated with the most interesting news. 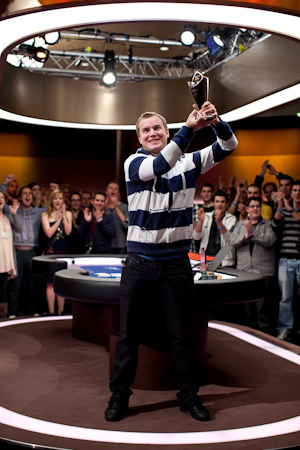 Swede wins EPT Bacelona for €825k! Posted on Monday, November 29, 2010 by "T". It ended up being Kent Lundmark from Sweden who won the EPT Barcelona Main Event, the biggest poker tournament ever held in Spain, and laid hands on the first place prize of €825,000. Lundmark is the 6th Swede ever to to win an EPT Main Event; the last being Anton Wigg who took down EPT Copenhagen in season 6. 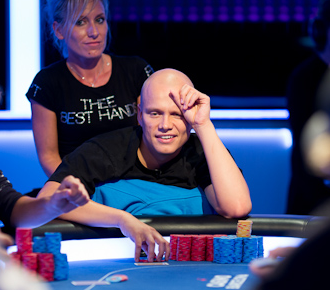 The EPT Barcelona win was Lundmark's third EPT cash ever and by far his best live result in his poker career. 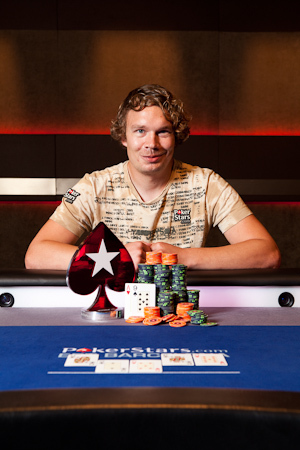 In the beginning of this year, he was runner-up in the Nordic Masters of Poker, earning $69,000, and also he was the last standing Swede at the the PokerStars Caribbean Adventure in the Bahamas (29th place for $66k). 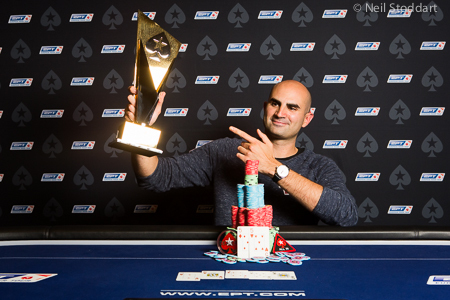 Read more » Swede wins EPT Bacelona for €825k! Posted on Friday, November 26, 2010 by "T". The EPT Barcelona Main Event is now, after a very long day (Day 3) that finished about 2 hours ago, down to only 24 players. In the lead is Giuseppe Pantaleo, the German, from Bieledfield, who won the Sunday Warm-up during EPT Tallinn earlier this year. 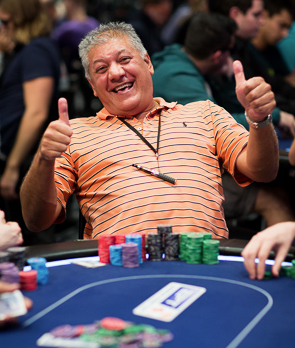 Pantaleo started Day 3 with a 622,500 stack and played fantastic poker from start to finish. Today, he will return with a 2.3 million stack, and if he plays as good as yesterday there is no doubt that he could win the tournament and lay hands on the first place prize of €825,000. All the remaining players are guaranteed at least €20,000 each. The 9 players who make it to the final table are guaranteed to bring back home with them at least €50,000 each. Posted on Thursday, November 25, 2010 by "T". Marco Bognanni from Italy is in the lead with a 1.2 million stack at the moment. Only 20k chips behind him is the PokerStars qualifier Roman Mahklin from Russia. There are lots of PokerStars qualifiers left in the tournament, but unfortunately not so many familiar faces. 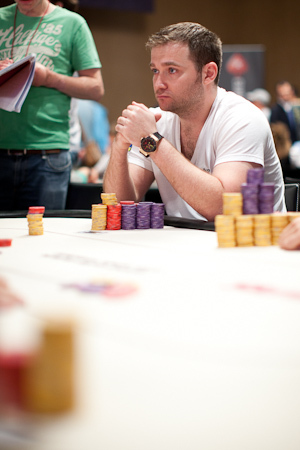 The only remaining Team PokerStars Pro is Matthias De Meulder with 434,000 chips. The tournament feels very open at the moment. In other words, anything can happen. We will return with an EPT Barcelona Main Event update as soon as Day 3 comes to and end. Posted on Wednesday, November 24, 2010 by "T". Lots of pros took part in Day 1b of the EPT Barcelona Main Event and made it to a much more interesting day than the first starting day. 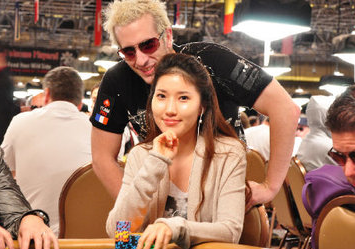 These are a few examples on PokerStars Pros who were among the 262-player field who survived the day: Live Boeree, ElkY (ElkY's girlfriend, Cathy Hong, made it as well - she won her seat in a live satellite), Johnny Lodden and Leo Fernandez (4th place). Day 2 will kick off in just a few hours - there are 339 players left. In total 758 players from 53 countries took part in the Main Event - creating a total prize pool of €3,790,000. First place will get €825k and 112 places are paid. Posted on Tuesday, November 23, 2010 by "T". Day 1a of EPT Barcelona attracted a field of 263 players. At the end of the day 137 players had survived and they will now have a 1 day break before it's time for Day 2. The one who will bring the most chips, 217,700, to Day 2 from Day 1a is an unknown player called Loic Sa. Loic Sa has only won about $8-9k before this tournament, so we can only wish him the best of luck with the rest of the tournament! Most interesting hand during Day 1a was for sure the all-in between Team PokerStars Sportstar Fatima Moreira De Melo and Team PokerStars Pro Alexandre Gomes. Fatima pushed all-in with 3 of a kind, and Gomes called with a flush draw/royal flush draw. The turn card gave Fatima a full house, and Gomes turned to the poker gods for help. BAM! Gomes one outer landed on the river and gave him a royal flush. De Melo had been eliminated from the tournament! De Melo looked a bit chocked when she left the casino, and who can blame her for that!? Posted on Monday, November 22, 2010 by "T". 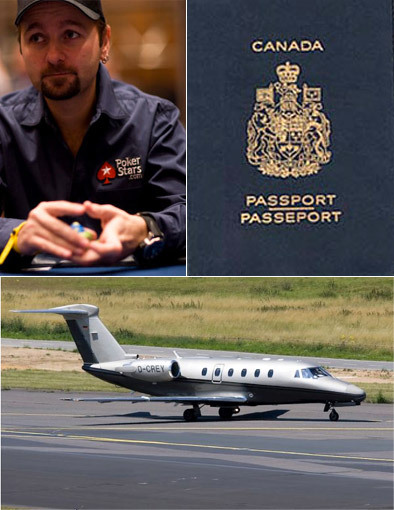 In Daniel Negreanu's latest blog one can read about the hassle he recently had to go through to be able to make it to EPT Barcelona. The reason for all this hassle was that his passport had expired, and due to some miscommunication between him and his assistant, Patty, the passport hadn't been renewed only days before EPT Barcelona - a tournament that Daniel had been looking forward to for a long time. 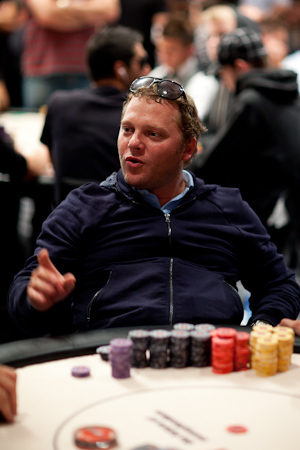 EPT Barcelona starts today - will Phillips defend the title? Ladies and gentlemen, we are just hours away from EPT Barcelona - one of the biggest and more prestige full stops on the tour. Just like last year, we can expect a huge field of players to take part in the Main Event with a buy-in of €5000+€300. Defending champion Carter Phillips, EPT Snowfest winner Allan Baekke and EPT Vilamoura winner Antonio Matias are 3 of the most interesting names that already have announced that they will take part in the Main Event. PokerStars has been running lots of satellites for EPT Barcelona. Now over 160 online qualifiers players are on their way to Barcelona to take part in the Main Event. Some of them have won their entry for as little as €7.50 - now they have the chance of winning some serious cash that can take their poker career in the right direction. Posted on Thursday, June 10, 2010 by "T". Carter Phillips had his breakthrough last year when he became the EPT Barcelona, but since then we haven't heard much from him. He has been playing in quite a few tournaments but not won any bigger amounts worth mentioning. However, tonight the long-awaited payday finally came for the 21-year-old American as he took down the $1,500 buy-in six-handed no-limit Hold'em tournament (event 16) at 2010 WSOP. EPT Warsaw: EPT Barcelona winner in the lead! Posted on Thursday, October 22, 2009 by "T". 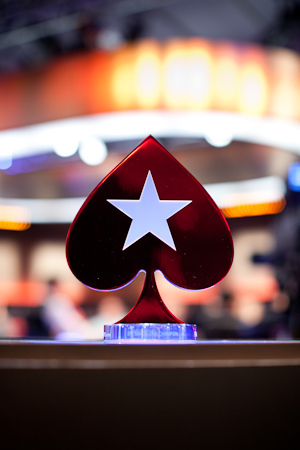 A total of 203 players (Day 1a=88, Day 1b=115) entered the Main Event of EPT Warsaw this time. Of these 203 players, 148 made it to Day 2 of the tournament. 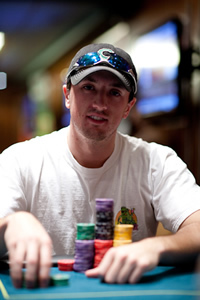 In the lead is PokerStars qualifier Carter Phillips from North Carolina with 194,850 chips. 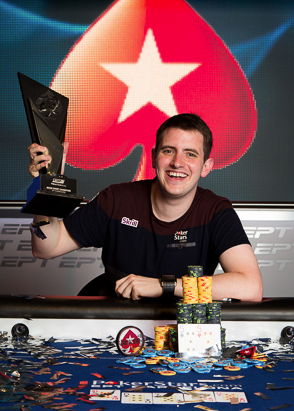 Phillips, seems to be on an EPT roll at the moment as he took home EPT Barcelona just a month ago. 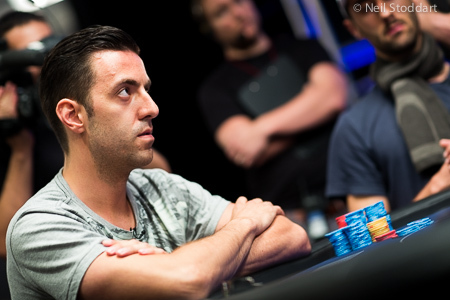 Luca Pagano, the Team PokerStars Pro from Italy, is still up among the leaders with 101,575 chips. It will very interesting to see if these 2 players will continue playing great poker and stay in the top till Day 3 of the tournament.